O’Reiley’s makes its debut! I always loved the bar setting in the original comic books (and our whole alcohol theme), though when I first drew it I wasn’t even of drinking age and hadn’t truly been in a bar (aside from sports bars or restaurant-ish bars). Well, I’m a man grown now, and I’ve been to my fair share of watering holes (though not as many as Alex, that lush). So when I had the opportunity to redo O’Reily’s I really wanted to do it right. Firstly, I wanted it to feel like a real bar. But beyond that I wanted it to feel like an extraordinary Irish pub. A place where the reader would want to go. Pubbed out to a level of almost mythic proportions. So I really to my time to create this setting, picking out exactly the style and elements I wanted, which was beautiful old school woodwork, stone floors and exterior, and antique stuff all over the place. At the same time I wanted it to be a little dark and dank, as all good bars are. Why worry so much about this setting? Well, if you read the original comic books you’ll recall that the characters spent a lot of time at the bar. Don’t be surprised if that’s the case again. In fact the bar is more important this time around. Look at the title: Two Drink Minimum. It wasn’t chosen at random. Lets just say the bar is more of a story element this time around and I’ll let you learn why as the story continues. Beyond that we’ve got the re-debut of several characters here. Firstly O’Reily himself, who has undergone some costume changes but is mostly the same character design. From behind loyal fans can probably pick out the Fisherman (Alex’s favorite character) and the great Native American hero Jon Killigbear. These two look about the same, from behind at least. 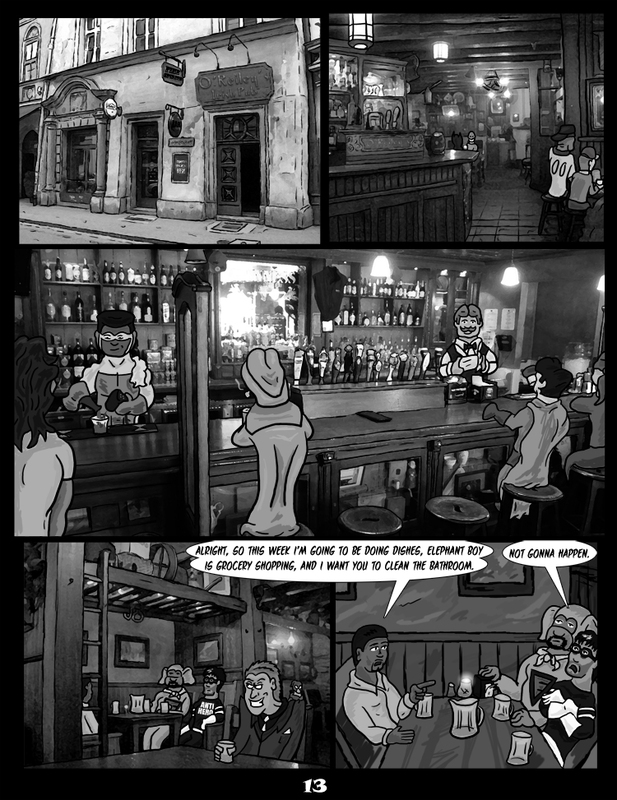 Even more loyal fans will recognize the bartender as Black Power, from the comic strip of the same name. I didn’t change his design at all. It wasn’t that long ago I came up with it. Though it is absurd that he bartends in full costume! Oh, remember when I said one of our goals was more black characters this time? See, I wasn’t lying. In fact lets jump ahead to Black Snow, Elephant Boy and Eric. That’s right, Eric and Elephant Boy have undergone some redesigns, and part of that was changing their ethnicities. Eric has been completely redone as a black man, so no more Nazi! Regardless of the ethnic change we planned on doing away with the Anti-Nazi this time around. It was something we grew to regret and question, and didn’t really seem to fit the character as time went on. In stead of simply making a darker version of the Eric character design I really wanted to come up with a new African American look that still fit his personality. I think I did, though he might be a little too cool looking, as I was going for well trimmed and slightly reserved. I dunno. I’m sure it will gel as we see more of him. BTW, just because he’s black don’t think we changed his personality. In fact Alex wrote much of this scene after he forgot we decided to make him black. Elephant Boy always bothered me. He was just too goofy. I had to change something to alleviate that, even just a bit. I toyed with many ideas, then I decided his trunk really had to go. Oh, I also gave him more realistic elephant ears. I didn’t originally plan to change him from being white, it just sort came about while I was drawing. Is he Black, Mexican, or something else? I think he is of mixed race now. So more diversity! Then there’s a bunch of other characters on the page. Are they anyone of consequence? You’ll have to wait and see! So in closing, this was a hell of a page with a lot of re-imagining and setting things up for the future, but I expect the rest of the scene will flow well and come along rather quickly. 2 Responses to "Page 13 and the Change"
Very nicely done! A really convincing bar feeling from this scene. You’ve got quite the sharp eye! Can’t get anything past you Rawr.